New Delhi: â€œGlobal Media Meet is designed to bring out all those points which probably an ordinary reader or viewer cannot predict as a customer of media. 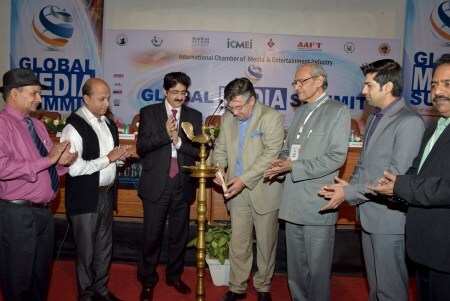 He is influenced by the tricky news and get emotional on wrong information,â€ said Sandeep Marwah President of Marwah Studio in the first session organized by International Chamber of Media and Entertainment Industry at Marwah Studio, Film City Noida. â€œPeace do exist in the World. The more you are close to the nature the more you realize the peace, which is state of mind. Whenever there is difference of opinion it destroys peace and take the shape of irritation and restlessness,â€ said H.E. Dr. Sabit Subasic Ambassador of Bosnia And Herzegovina to India while inaugurating the Global Media Summit. More than 25 countries including Hungary, Tanzania, Myanmar, Afghanistan, Sudan, Ghana, Thailand, Botswana, Lesotho, Uganda, Zimbabwe, Ethiopia, Papua New Guinea, Syria, Tajikistan, Turkmenistan, Uzbekistan, Bhutan, Nigeria, Bosnia And Herzegovina and India participated in the summit planned in association with Ministry of Skill Development And Entrepreneurship, Government of India on the Role of Media in bringing Peace. A short film on Padmashri Dr. Shyam Singh Shashi directed by Raghav Marwah was released by Dr. Sabit Subasic the Ambassador of Bosnia And Herzegovina Present on the occasion Dr. Shyam Singh Shashi a writer of more than 400 books extended his lifetime services towards maintaining peace in the nation. A poster of 8th Global Film Festival Noida was also launched by the dignities. Ashok Tyagi Secretary General of ICMEI, Dr. A.K.Srivastava Director General ASMS, Sushil Bharti Festival Director ICMEI shared their views. Large number of film, television and media professionals along with students of Asian School of Media studies and Asian Academy of Film And Television participated in the summit. The members of International Chamber of Media And Entertainment Industry, World Peace Development And Research Foundation, World Religious Confederation, Global Yog Alliance, Association of Asian Union, and International Human Rights Association affiliated to United Nations were also present during the summit.